As we get closer to winter vacation and recital time, the excitement in my house is becoming palpable! That’s because we’re having our 3rd child join us in just a few more days! Having this deadline set for months has helped me get ahead on Christmas gifts and planning traditions earlier instead of procrastinating. Hopefully we really have everything set and we’re ready for this next big change in our home! So today, I’m prepping all of my activities for this month and wanted to round up all of the fun Christmas activities we’ve shared with you over the past years on our blog. First up – our favorite Christmas Song Mix Up game. This works with groups or partners or even single student lessons! It’s a high energy race to finish matching them up before the other team. 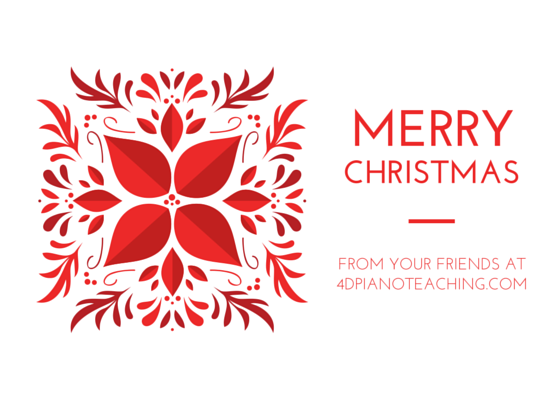 Need a simple program for your winter recital? This free printable will print with only black ink and to spice things up, try using a silvery sparkling paper! Thinking about what to do at the lesson after the recital but before winter break? Look at this post for a quick idea to add to your lesson plan. Then finally, think about what you’re sending them home to do over winter break. Thinking of a practice challenge? Then check this idea out! Now are you all set for December?! Good luck with the business of this season. And Merry Christmas! Join our mailing list to receive all our latest posts straight to your inbox. Subscribe For a Free E-Book!